You visit the same ports on your way back, as on the northbound voyage, but you arrive at other times of the day. The view and the sea become more dramatic as we sail towards Kirkenes. Kirkenes is only a few kilometers from the Russian border and the Sami communities in northern Scandinavia. Kirkenes is known as the capital of the Barents region and the harbor to the east. The summer is amazing in Kirkenes with up to 30 degrees of heat and the locals speak Norwegian, Sami, Finnish and Russian, which also reflects the culture of Lapland. On the trip south, along the Norwegian coast, we now visit the ports we visited during the night on our way to the north of the day. Start your day with a breakfast at North Cape and discover hidden parts of Finnmark along the way. Later in the day there is a stay in Hammerfest, but before arrivak you will enjoy an ‘energy coffee’ on deck. In spring, we sail throough the beautiful Lyngenfjord, surrounded by the snowy peaks of the Lyngen Alps. This place is known for the good taste of fresh locally-caught prawns. We dock at Tromsø where you are invited to a very special musical experience - a midnight concert at the Arctic Cathedral. Early in the morning we arrive to Harstad where you have the opportunity to participate in the excursion ‘A taste of Vesterålen’. Those who choose to stay on board can admire views of Trondenes Church that dates back to the Middle Ages. The voyage continues through wonderful Lofoten. Hurtigruten sails through a stunning scenery of islands. Before arrival to the port Svolvær we visit the impressive and magnificent Trollfjord during the spring, summer and fall. Trollfjord is only 2 km long and 100 meters wide, sourrounded by majestic mountains. Weather we enter the fjord depends on the weather. The fjord is also the realm of the sea eagle. You can join in on an excursions where we will try to get close to this majestic bird. Reaching Svolvær you can take a walk around in the city on your own or join our Lofoten Islands tour to learn more about the fishing community, scenery and area. 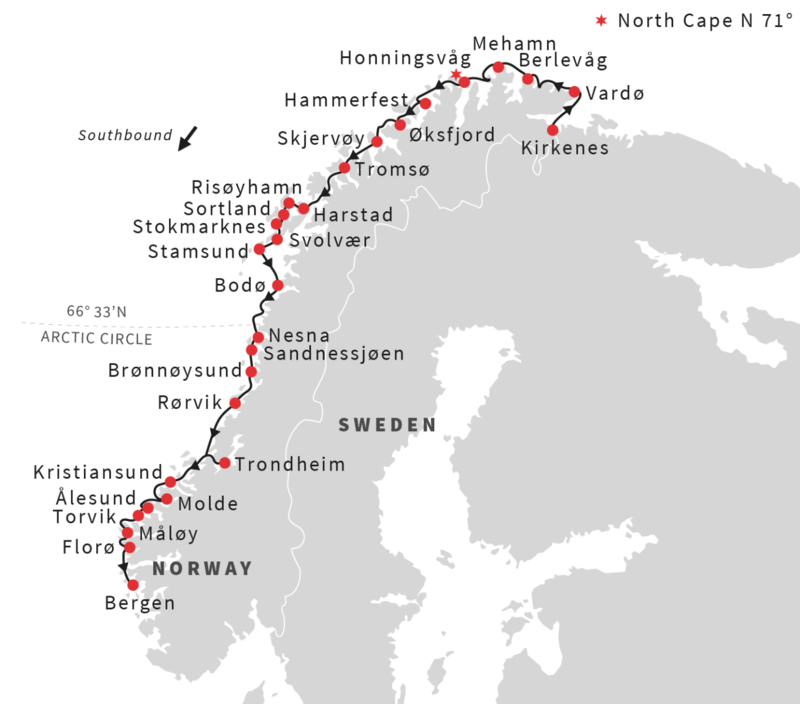 Day 10: The Polar Circle and "The Seven Sisters"
Today we visit the beautiful coast of Helgeland, which consists of hundreds of islets, and fertile agricultural areas. It is the last day of the trip north of the polar circle. We will celebrate this crossing of the Arctic Circle on the deck with a ‘tast’ of Arctic tradition – a spoonful of cod liver oil. From the deck you can see the unique mountain formations like "The Seven Sisters" and "Torghatten". The Seven Sisters are a mountain range all between 900 and 1.100 meters high. The formations are all a part of a myth with the seven troll sisters that became rocks. The Vega islands is on UNESCO's list of world cultural and natural heritage sites and can be visited on an optional excursion during summer. The landscape consists of dozens of islands. Afterwards we arrive at Sandnessjøen. We have the opportunity to visit the lovely city of Trondheim. Did you see Nidaros Cathedral? Well, here there were three queens and seven kings crowned and it is Scandinavia's largest medieval building. On our way out of the 170 meters long Trondheimsfjord we will head towards Kristiansund. It is located on the spectacular renowned Atlantic Road and it is considered as Norway's capital for dried cod "klippfisk", which is the most important Norwegian export port for dried fish. Last day of the voyage. The classic round trip with Hurtigruten along Norway's coast ends when the ship returns to the quay in Bergen again. Filled with memories of the world's most beautiful voyage where you have now visited 34 ports times two. You can arrange transport to/from Norway when you have received the invoice with confirmation.